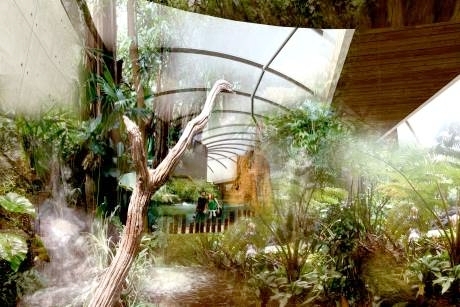 Work has started on Marwell Zoo’s Tropical House exhibit, the largest to be built at the zoo, at Owslebury, marking the second phase of a £17 million investment programme over the next decade. Creating improved habitats for animals and more immersive experiences for guests, Tropical House is planned to open for Easter 2018. The new attraction will span two levels, offering vantage points across a tropical canopy and the opportunity to experience the life of the forest floor. Visiting schools will have the opportunity to enjoy uninterrupted, close-up views of new mammals, birds, reptiles, amphibians, fish and insects, whilst learning about the flow of energy through life. In addition, the interactive Discovery Zone will reveal how the energy people need to power modern lifestyles is generated and how alternative renewable forms of energy can help animals and humans alike. The zoo is offering a variety of Key Stage 1, 2 and 3 workshops, with the majority of them running for 40 minutes at the set times of 10.30am, 11.30am and 12.30pm. Workshops cover a wide range of topics for all age groups and abilities and can cater for a maximum of 30 students per workshop. Key Stage 1 workshops include All About Animals, a pupil-led session that can be tailored to suit most topics on living things, and Animal Habitats, which identifies various animals in their habitats, among other sessions. Key Stage 2 workshops include Conservation, during which students explore how human actions affect the world, Rainforests, and Life Cycles, which compares life cycles of amphibians, mammals, insects and birds. Key Stage 3 sessions include Animal Adaptations, allowing pupils to identify different adaptations, and Conservation. All three Key Stages feature a Working Scientifically workshop on different topics. You can book a visit to Marwell Zoo online on www.supersaas.co.uk/form/Marwell/Log_In_Decider or to find out more, visit www.marwell.org.uk/education.